At first, the obvious answer was a supernova. When a transient bright spot flares up in the sky, that’s the first thing astronomers think, and the first thing they try to confirm, or rule out. There are different types of supernovae. The most well-known occurs at the end of a massive star’s life. In this case, a star can no longer sustain fusion in its core. Eventually, gravity overpowers the star and it collapses. This causes a massive explosion that outputs an enormous amount of energy for several months. Another kind is caused by a white dwarf in a binary system with another star. A white dwarf can accrete matter from its companion until it reaches a critical mass and runaway fusion happens. This type of supernova can be 5 billion times brighter than the Sun. 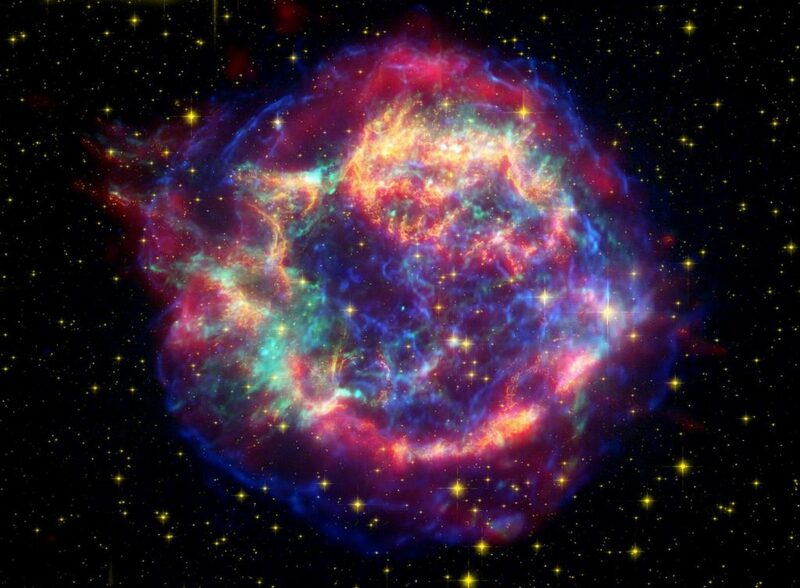 Supernova aren’t exactly rare, depending on how you look at it. There are about three of them every hundred years in the Milky Way. But with all the powerful telescopes on Earth, we see them well outside our own galaxy because they’re so bright. ATLAS, the telescope system that spotted the Cow, has spotted 2,795 supernovae since it began operations in 2015. Amateur astronomers even discover them. But all supernovae light up for several months. The Cow didn’t last that long. It only flared brightly for about 16 days. Its short duration ruled out a supernova. Black Hole? Or Neutron Star? Like a supernova, the Cow was also extraordinarily bright. But it was between 10 to 100 times brighter than a supernova. For astronomers, watching an active supernova is exciting, but the Cow was something else, and nobody was sure what. Excitement and curiosity spread. A team of astronomers led by Raffaella Margutti at Northwestern University went to work. Astronomers study stellar deaths in visible light, but the team combined several types of observations from different telescopes to help them understand what they were seeing. They analyzed the Cow’s chemical composition, and it included hydrogen and helium. That ruled out merging compact objects as a cause. They gathered images in hard X-rays, X-rays, gamma waves, and radio-waves. They used a who’s who of telescopes to study the Cow, including the Keck Observatory, the MMT Observatory, the SoAR telescope, NuSTAR, INTEGRAL, and XMM Newton to study the Cow. Since they weren’t relying only on visible light, they were able to study the Cow long after its initial flaring had died down. They began to speculate on what they were seeing. The team thinks they’ve witnessed the exact moment that a supernova collapsed to form a compact object; either a black hole or a neutron star. Stars collapse into black holes and neutron stars all the time. The event itself isn’t exactly rare. But seeing it happen is rare. Margutti and the rest of the team were able to study the Cow so closely because in a way, it was naked. The Cow is also close to us, in astronomical terms, making it easier to study. It’s only 200 million light years away, in the dwarf galaxy CGCG 137-068. Margutti and her team presented their results at the 233rd American Astronomical Meeting last week. Their results are also published in a paper. A tidal disruption event happens to a star that approaches a powerful black hole. The gravity from the black hole tears the star apart into a stream of gas. The black hole flings the tail of the gas stream out of the black hole system, but the leading edge of the stream swirls around the hole and eventually collides with itself. This second team of researchers think that the star that got shredded was a white dwarf, the same type of star that our Sun will eventually become. They also calculated the size of the black hole and concluded that it’s mass would be between 100,000 to 1 million times the Sun’s. This makes it an enormous black hole, similar in size to the one at the center of the Cow’s galaxy. That would be very unusual, but not impossible. Kuin’s team also shared their findings at the 233rd AAS Meeting, and their results were published in a paper. Research Paper: Swift spectra of AT2018cow: A White Dwarf Tidal Disruption Event? What does that mean? If you have 1 unit of material normally, and there are 10 times less material, does that mean you have -9 times the normal amount of material? What is -9 times the amount of material? What does this sentence mean? If you are trying to say one tenth, by all means, please say that. It’s not hard.